madeleine brown handmade: A Courageous Man. Thought you might like to see what became of this. Almost always it is a woman who approaches me about designing her engagement ring (although with her prospective fiance as a willing participant, of course!). Designing 'surprise' engagement rings for a fellow always makes me very nervous... it's a brave (or silly??) thing to do. My husband would never have dared pick out an engagement ring for me- I didn't know what I wanted myself. But when Omar contacted me, he had given so much thought to his love's style and personality that I never was worried. He even sent me photos of her and links to her old band's music videos on YouTube. 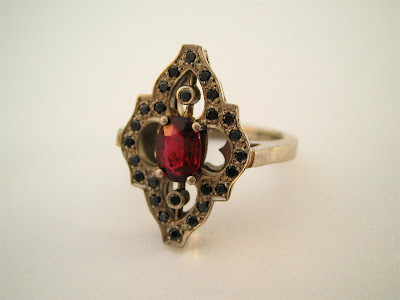 Together we designed this unique ring with black diamonds and a stunning Thai ruby. And when I finally met the newly-engaged Maryanne this weekend, I felt I'd known her for ages! Congratulations Omar and Maryanne- such a lovely couple to work with- I'm so very happy for you both. it's got a nicely exotic, old- or otherwordly look about it. Something an old venetian trader might've brough home from the East, way back when. Nice! Hmm, I like the sound of that! I actually have Venetian ancestry, belive it or not... So you might be on the right track, Rino! Love the black diamond and rich red ruby combination. Just gorgeous!